I gave a talk entitled 'Bayesian Reasoning and Deep Learning' recently. Here is the abstract and the slides for interest. 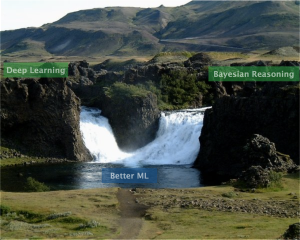 Deep learning and Bayesian machine learning are currently two of the most active areas of machine learning research. Deep learning provides a powerful class of models and an easy framework for learning that now provides state-of-the-art methods for applications ranging from image classification to speech recognition. Bayesian reasoning provides a powerful approach for information integration, inference and decision making that has established it as the key tool for data-efficient learning, uncertainty quantification and robust model composition that is widely used in applications ranging from information retrieval to large-scale ranking. Each of these research areas has shortcomings that can be effectively addressed by the other, pointing towards a needed convergence of these two areas of machine learning; the complementary aspects of these two research areas is the focus of this talk. Using the tools of auto-encoders and latent variable models, we shall discuss some of the ways in which our machine learning practice is enhanced by combining deep learning with Bayesian reasoning. This is an essential, and ongoing, convergence that will only continue to accelerate and provides some of the most exciting prospects, some of which we shall discuss, for contemporary machine learning research. Do agree that they're both eventually headed the same way. In total agreement with the observations that not only is there eventually some kind of convergence but that methods in both fields can be used to expand the capabilities of each other.